ORDERFOX sees 40% higher response rates with 3D viewing. ORDERFOX.com uses Forge to support visualization of more than 50 file formats within its production partner sourcing feature. ORDERFOX.com brings the industrial sector together, offering the CNC industry a platform that’s 100% free to join and use. Within the platform, members can find the right production partners, personalize their own events calendar, explore industry trends, list or buy machines, find local financing options, research transportation resources, and more. With a rapidly expanding set of features, ORDERFOX plans to keep adding to its base of validated members within the CNC metal and wood industries and beyond. CNC machines cut, carve, machine, turn, and mill metal, wood, and many other materials. These machines play a vital role in many areas, from producing custom hardware for construction to crafting custom parts for manufacturing. It can be difficult for people who need CNC services to find appropriate production partners. Enter ORDERFOX—which brings together CNC production partners in a forum that’s efficient for all parties. How ORDERFOX solved it with Forge. ORDERFOX wanted to include the ability for buyers to incorporate a visual representation of their work-pieces within the RFP (request for proposal) process. ORDERFOX initially considered developing a solution that incorporated viewing of a limited number of file types typically used within the industry. Then, the ORDERFOX team spoke to Autodesk about incorporating Forge into its platform. With Forge offering a number of advantages and supporting more than 50 file types used within the industry, Forge has helped ORDERFOX provide viewing access to files to all stakeholders in the production partner sourcing process. That means people in every role—from design to engineering to procurement—can view files without needing specific software or file conversion capabilities. Plus, the intuitive Forge Viewer makes model viewing easy, even for industry participants with little or no design software experience. To prepare files for viewing, ORDERFOX uses the Forge Model Derivative API. A buyer with a CNC job can log into ORDERFOX.com, enter the required information, and upload the associated design files. Companies within the CNC industry can easily find jobs that match their availability and equipment. They can then use the Forge Viewer to review designs and provide a detailed estimate directly to the buyer. With the addition of the Forge Viewer, buyers can connect with the right production partner quickly and easily. ORDERFOX has found that response rates increase for posts that include viewable designs. 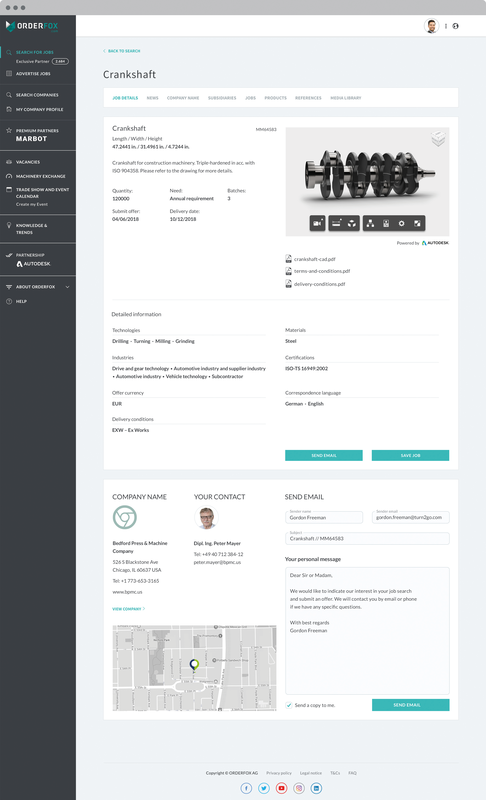 "We came to Autodesk with the idea of providing direct access to ORDERFOX within Fusion 360, AutoCAD, and Inventor, as well as a concept for integrating the Forge Viewer into our platform. Now with the help of the Forge team, all of our members can easily post or view work in more than 50 design file types, and our developers can now spend more time creating additional unique features for our members." Cadac and Royal BAM teamed up to bring relief to construction industry companies struggling with tightening deadlines and project budgets. CADshare chose Forge to provide the core viewing and model-management power needed to transform OEMs’ sales of spare parts. Moicon increases factory performance and decreases costs in a scalable, affordable manner with Forge.